Christopher, A.; Fernandez, J.; Martínez, E.; Funes, M.; Engel, E.; Errachid, A.; Planell, J. A.; Samitier, J.
MG63 cells cultured on regular arrays of point microstructures (posts and holes) are shown to preferentially align at certain angles to the pattern of the structures, at 0 degrees, 30 degrees, and 45 degrees in particular. The effect is found to be more pronounced for post rather than hole structures (although no significant difference is found for the angles the cells make to the holes or posts) and is thought to be due to the fact that the cells use the posts as anchorage points to hold themselves to the surface. It is also shown that cells preferentially align with the structures depending on the dimensions of the structures and the distance between neighboring structures. This is important when designing structured surfaces for cell-surface interaction studies for materials to be used in, for example, drug delivery or tissue engineering. MG63 cells cultured on regular arrays of point microstructures (posts and holes) are shown to preferentially align at certain angles to the pattern of the structures, at 08, 308, and 458 in particular. The effect is found to be more pronounced for post rather than hole structures(although no significant difference is found for the angles the cells make to the holes or posts) and is thought to be due to the fact that the cells use the posts as anchorage points to hold themselves to the surface. It is also shown that cells preferentially align with the structures depending on the dimensions of the structures and the distance between neighboring structures. This is important when designing structured surfaces for cell–surface interaction studies for materials to be used in, for example, drug delivery or tissue engineering. Christopher, A. [et al.]. 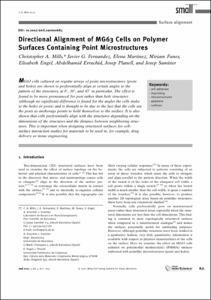 Directional alignment of MG63 cells on polymer surfaces containing point microstructures. "Small", Maig 2007, vol. 3, núm. 5, p. 871-879.